Connect and control via USB cable from Windows and Mac. 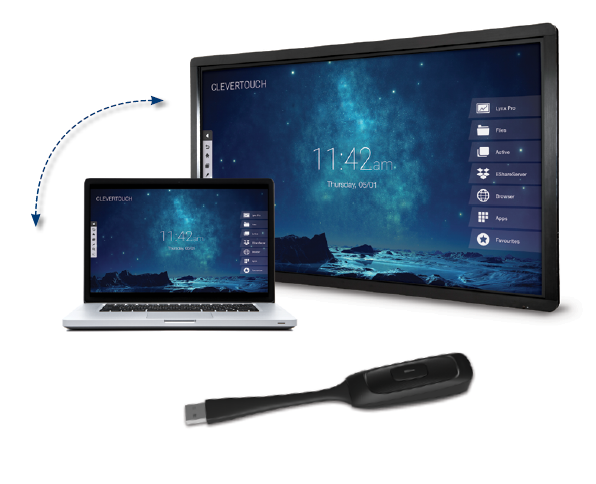 Clevercable is the hardwired version of our Clevershare technology and enables screen mirror and touch from your Windows or Mac computer to your Clevertouch via the USB port. Note: Clevercable comes as standard with every purchase of a Pro Series screen. What is the length of the USB cable that is included with Clevercable? What is the resolution that Clevercable will display? Can Clevercable be used with any other manufacturers interactive flat panel display? No, for CleverCable to operate it will detect that it is connected to a compatible Clevertouch product. Which operating systems are supported by Clevercable?